In spite of its obvious importance and popularity, the field of cognitive development remains highly fragmented, scientifically. Instead of theoretical convergence towards a generally accepted set of principles, there remains a vast diversity of models of what knowledge and reasoning are, and how they develop. Courses and books tend to deal with this perplexing situation by simply presenting students with either a specific, favoured line, or by offering selections from the theoretical salad. As a result, students have great difficulty in obtaining a cohesive picture of the area. They are frequently bewildered by the diversity of schools, frameworks and approaches, with seemingly little connection between them. More seriously, they are deprived of a critical grasp of the area, and thus forced into a habit of early selectivity, rote memory of specific models in isolation, and regurgitation at exams. This in turn deprives the area of cognitive development of important critical impetus for future improvement. Models of Cognitive Development is an attempt to overcome these problems. It does this by arguing that the vast diversity of theories or models can be organised into groups according to a much smaller set of underlying assumptions or preconceptions, which themselves can be historically interrelated. By understanding these, students may be helped to find their way more confidently around the area as a whole, to see the 'wood' as well as the theoretical forest, and thus find themselves in a position to react to individual models more positively and more critically. Such criticism may, in turn, assist theoretical progress and unity in the future. 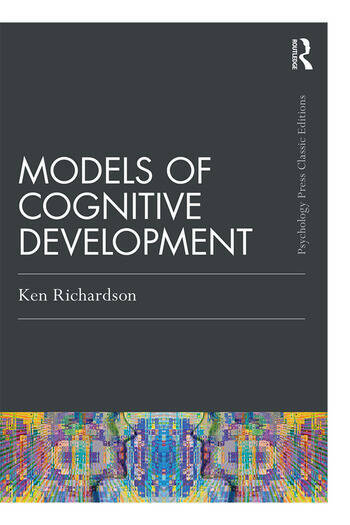 Models of Cognitive Development covers all the contemporary theoretical and research strands in the area, with numerous examples, in a clear and straightforward manner, and should be useful to all students, researchers, and comparative theoreticians in the area. 1.Nativist Models. Introduction. Contemporary Nativism. Natural Mechanics and Natural Computations. Development of Concepts and Categories. The Modular Mind. Smart Infants. "Hard and "Soft" Nativism. Practical Applications. Criticisms of Nativist Models. Evolution and Nativism. 2. Associationist Models. Introduction. Behaviourism. Cognitive Associationism. Semantic Networks. Developmental Models. Concepts. Covariations, Causes, Rules and Schemas. Applications of Associationist Models. Criticisms of Associationism. 3. Constructivist Models. Introduction. Gestalt Psychology. Modern Schema Theory. Mental Models. Mandler's Theory. Piaget's Theory. Cognition in Context. Other Criticisms of Piaget's Theory. Piaget's New Theory. Practical Applications of Constructivism. Criticisms of Constructivism in General. 4. Sociocognitive Models. Introduction. Social Nativism. Social Associationism. Social Constructivism. Piaget and Vygotsky Compared. 5. Models Mixed and Models New. Introduction. Nativism with Constructivism. Nativism with Associationism. Nativism with Constructivism and Associationism. Connectionism. Ecological Realism Theory. Dynamic Systems Theory. Cognitive Hyperstructures. A Confluence of Models? References. Author Index. Subject Index.